Most people believe that beer swells and bulges. 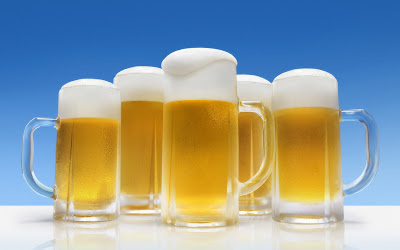 One study showed that beer is not responsible at all for the increase and abdominal bloating but its accompanying. The survey showed that those who drink beer, they are accompanying it with snacks with high fat content such as potato chips, sausages, pasta and other similar. The beer-bulge is simply a myth. So if you like beer, it can be enjoyed in moderation. Beer ,even if it seems to be weird, thanks to its low caloric value is ideal even in diet, but to avoid snacking accessories. The caloric value of the alcoholic beverages depends on the content of alcohol each drink has. In the case of beer alcohol content is about 5% and 12% in the wine. In the whiskey, vodka and in other spirits the amount of alcohol is about 43%. In other words, beer has less alcohol, fewer calories and fatten less than the wine and other spirits. A glass of beer has only 100 calories and a glass of white wine has 120 calories and red wine about 130 calories. Other drinks can reach 200 calories per glass. So, cheers with a glass of beer!